The other night, I had a dream - I thought it was a dream, but it was definitely a nightmare. And actually, at first, I thought it was real, which really scared me. This dream was different because it was set in my own bedroom - nothing out of the ordinary. I can usually understand physical feelings and the settings are really detailed - I usually have really vivid dreams - but this one was so close to my reality that I almost believed it for a second. In the dream, I was lying in my bed, totally comfortable. I had my favorite pillows and my big down comforter - I wasn't too hot or too cold, I felt perfect. Then, the alarm goes off on my phone, time to wake up. 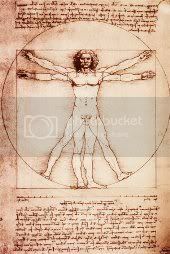 I'm laying in the bed with my arms and legs spread out - like Leonardo Da Vinci's Vitruvian Man. The blankets are torn off of me, and I move to get up, and my arms go flying. I pull them back and look at them to see what's wrong: they're thin. Somehow, in the middle of the night, I have reached what appears to be my goal weight. Nearly two hundred pounds just vanished. I try again to get out of bed, but my arms and legs keep flailing about. I try to stand up, and it feels bizarre. I start to walk, and I'm walking funny. My legs are wobbly (kind of bow-legged, even) and my back is arched. I keep trying to move, but I'm not used to this body, and I can't control my movements. Crazy, right? I think it may be related to some things that have been on my mind lately - mostly fears about my long-term goals. Luckily for me in this case, dreams don't come true, and I won't be losing all the weight overnight, so my body will have time to adapt to these slight weekly changes. But still, I have been overweight my whole life and obese for more than half of it, so thinking about walking around and only carrying less than half my current body weight kind of terrifies me. My weight has always been such a big part of my identity. What will I be when I'm no longer obese? How will I walk? What will it feel like? In the past when I've decided to lose weight, I never really considered the long-term. Maybe because I never really took it seriously and figured I would quit long before any of these thoughts became legitimate concerns. But this time, I'm committed - I'm making real changes and experiencing real success - and so I guess it makes sense that I have more on my mind besides the usual fantasies about how nice it will be to buy clothes from regular stores. It will be different, so, you have to mentally change, along with the body change.